The American Human Development Index, a supplement to the gross domestic product and other money metrics, tells the story of how ordinary people are doing. The index is based on the Human Development Index developed by the United Nations, the gold standard for measuring the well-being of people in every nation. This report is the fifth that Measure of America has produced on the state of California; previous reports include A Portrait of Marin, A Portrait of Sonoma County, and two volumes of A Portrait of California. 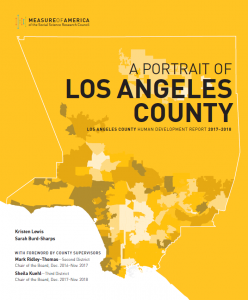 For this report, a ranked index has been calculated for 106 cities and unincorporated areas in LA County as well as the thirty-five community plan areas within the City of Los Angeles; for major racial and ethnic groups; for women and men; and for US- and foreign-born LA County residents. LA County’s overall HD Index score is 5.43 out of 10, which is higher than the US value of 5.17. This average masks huge variation, however. Some places and groups of Angelenos have very high scores and enjoy the highest levels of well-being in the country, while others face challenges akin to those found in impoverished areas of Appalachia and the Mississippi Delta. The highest-scoring locale in LA County is the City of San Marino at 9.43, and the lowest-scoring is Florence-Graham at 2.44. The American Human Development Index scores of Los Angeles County’s major racial and ethnic groups vary from relatively high scores for Asian and white Angelenos to far lower scores for Native American, black, Native Hawaiian and other Pacific Islander, and Latino residents. Among these groups, Asians score the highest on the HD Index (7.37), and Latinos score the lowest (4.32). If LA County were a country, its would rank eleventh in the world in longevity, with a life expectancy of 82.1 years. Angelenos can expect to live nearly three years longer than the average American and several months longer than the average Californian. Walnut Park has the county’s longest life expectancy, a remarkable 90.5 years, while Sun Village has the shortest, 75.8 years. For an in-depth exploration of life expectancy in LA County by place, see Highway to Health: Life Expectancy in Los Angeles County. Among major racial and ethnic groups, the longest-lived population is Asians, with a life expectancy of 87.3 years. Native Hawaiians and other Pacific Islanders (NHOPI) have a life expectancy of 75.4 years—almost a dozen-year gap. Asian and Latino Angelenos live longer than the average LA County resident; the remaining groups have life expectancies below the county average. Among Asian subgroups large enough to allow for reliable calculations, Indian and Chinese Angelenos have the longest life expectancy (88.1 years) and Filipinos have the shortest (85.5 years)—though the Filipino life expectancy is still 3.4 years longer than the countywide average. Women’s life expectancy is 4.9 years longer than men’s. Women live longer than their male counterparts in every racial and ethnic group, though the size of the gap varies. LA County lags behind the United States as a whole in educational attainment, in large part due to the comparatively large share of adults without a high school degree. LA County scores 4.96 on the Education Index (compared to 5.11 for the US), and more than one in five adult Angelenos lack a high school diploma. The highest-ranking community in LA County is Westwood in the City of LA (home to UCLA), with an Education Index score of 9.95. The lowest-ranking community, with a score of just 1.24, is Florence-Graham, which also ranks the lowest on the overall HD Index. Asians score the highest on the Education Index at 7.12, followed closely by whites at 7.02. The next-highest scores are significantly lower—4.69 for NHOPI and 4.64 for blacks. The lowest-scoring group is Latinos at 2.80; more than 40 percent of Latino adults over age 25 lack a high school diploma. Overall, women (5.10) tend to have higher educational attainment levels than men (4.82) in LA County, though this trend is flipped among Asians and NHOPI; in these groups, men edge out women. The disconnected youth rate—the share of young people ages 16–24 who are neither working nor in school—is a statistic that MOA calculates using public use microdata areas (PUMAs). There is a strong relationship between well-being in a community and the rate of young people who are connected to school or work. The overall youth disconnection rate in LA County (11.8 percent) is slightly lower than the US rate (12.3 percent). The area in LA with the lowest youth disconnection rate is West Central/Westwood and West LA in the City of LA (3.9 percent), and the area with the highest rate is South Central and Watts, also in the City of LA (23.0 percent). Median personal earnings in LA County are $30,700, slightly less than the US median of $31,416. The range within LA County, however, is striking—from a peak of $82,813 in Palos Verdes Estates to a mere $16,044 in Westwood, no doubt due to the large student population there. Median personal earnings are the wages and salaries of the person in the middle of the earnings distribution; half the population earns more than the median, and half earns less. Whites earn the most ($47,600) in LA County among the major racial and ethnic groups; this is the only component of the index for which whites outscore Asians ($38,000). Latinos in LA County earn the least, with median personal earnings of $22,600. Black Angelenos earn $6,500 more than blacks in the United States as a whole. Despite outscoring men in the overall HD Index and in both health and education, women earn less than men in every racial and ethnic group and tend to occupy lower-paying occupations and industries. Women continue to take on a disproportionate amount of unpaid caretaking labor, incur motherhood penalties, and experience wage discrimination. Shoring up the foundations of well-being for all county residents as well as building on the strengths and expanding the opportunities of the groups that are struggling today is key to a flourishing LA County tomorrow. The report thus concludes with an ambitious goal: to increase well-being for all county residents and narrow the gaps between groups, resulting in a one-point increase in the HD Index, from today’s 5.43 to 6.43, by 2025. Health: Addressing the social determinants of health, including economic security, through targeted efforts will extend life expectancy for all and achieve significant gains for the groups with the lowest life expectancies. Increase average life expectancy countywide by six months, from 82.1 years to 82.6 years, over this eight-year period and increase life expectancy for black, Native Hawaiian and other Pacific Islander, and Native American residents to 80 years. Education: Investing in parental education, quality child care, early childhood education, school integration, funding equality, and young people at risk for disconnection increases the likelihood that students will enroll in school and complete their degrees. Increase enrollment by 10 percent and boost adult educational attainment by 10 percent, focusing in particular on Struggling LA and Precarious LA and on Latinos countywide. Earnings: Increasing wages, improving workforce training and protections, and reducing the gender earnings gap will lift median personal earnings, enabling greater economic security and a chance for all Angelenos to invest in themselves and provide a safe, stable environment for the next generation. Increasing median earnings in the county by $8,000 (in inflation-adjusted dollars) over the eight-year period with an eye toward income equality will require a laser focus on workers whose median personal earnings are very low, namely Latinos and those in Precarious LA ($19,000 annual median personal earnings) and Struggling LA ($25,000).